Midwest Appraisal Management optimizes our Realtor® centric structure to create a custom, responsive, and systematic real estate appraisal solution; ultimately setting the standard for the real estate appraisal management process. Our appraisal management services begin with the recruitment and vetting of the appraisal panel. We contract with the best available real estate appraisers in Michigan, Ohio, Indiana, and Florida to perform appraisal assignments. We manage the communication pipeline of assigning, scheduling, and receiving each appraisal order. Appraisals are subject-to Midwest’s quality control/review process and the completed real estate appraisal reports are submitted to underwriters. Fees are collected from lenders for services provided and appraisers are compensated for services performed. Our goal is to ensure satisfactory delivery of a credible valuation product, with an emphasis on compliance and timeliness. Midwest Appraisal Management offers all of the traditional residential appraisal products required for Conventional, FHA, and USDA mortgage lending. *Click on each form below to see if it will meet your needs. Don’t see what you are looking for? Contact us for more information regarding our appraisal management services or for a custom solution. Quality Control Check is completed utilizing a combination of a manual check with an extensive automatized review (thousands of checkpoints) which flags possible errors, omissions, and inconsistencies in the report. Next, Midwest Appraisal Management works with the appraiser to resolve any potential report deficiencies, dramatically reducing or eliminating underwriting revision requests. This Quality Control Check can also be utilized for both pre-funding and post-funding QC audits. Desk Review Without Reviewer’s Opinion of Value is completed by either a local market appraiser or one of our Certified Residential Staff members for both pre-funding or post-funding audits on a general purpose appraisal review form. 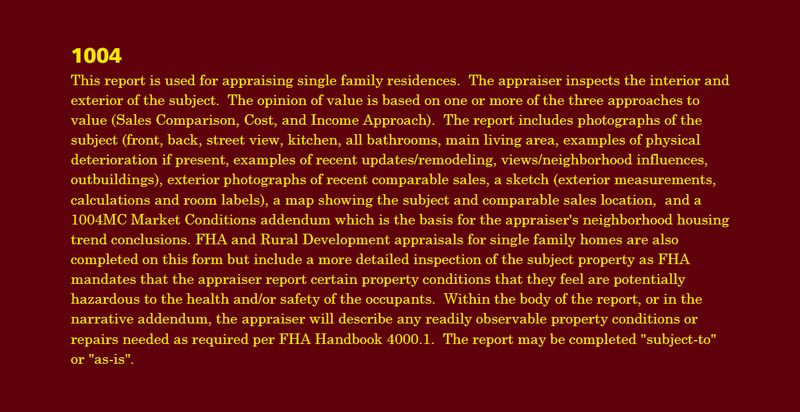 The Review Appraiser does not give an opinion of value. The Purpose of the desk review is to determine if the results of the work under review is credible, given the intended use. The reviewer indicates which section of the appraisal under review is accepted or not accepted as credible and in compliance with the client’s requirements, reporting requirements of USPAP, and applicable laws or regulations. The reviewer’s use of the acceptable information, analysis, opinions and conclusions from the work under review is based on an extraordinary assumption, meaning the reviewer is assuming the integrity of the work without personal verification. Field Review is reported on Form 2000 for a one unit property. It is completed by a local market appraiser that is familiar with the subject property are and market trends and has access to local market data. The review appraiser reports whether the comparable sales used in the report under review are the most similar to the subject and whether the market value for the subject property was reasonable as of the effective date of the appraisal. At a minimum, the review appraiser reads the entire report under review, inspects the subject property and the comparable sales from the street, inspects the neighborhood in which the subject is located, researches all appra=appropriate data, verifies the data in the original report using reliable sources, and assumes the property condition reported in the original appraisal report is accurate, unless there is evidence to the contrary.